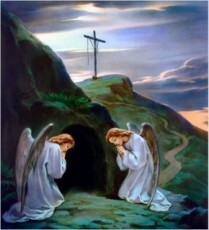 Holy Saturday, sometimes called in Latin – Sabbatum Sanctum, is the day after Good Friday. It is the day before Easter, and the last day of Holy Week in which Christians prepare for Easter. It commemorates the day that Jesus Christ’s body laid in the tomb. In Catholic Churches, the Altar remains stripped completely bare, following the Mass on Holy Thursday. Holy Communion after the Good Friday service is given only as Viaticum to the dying. Baptism, Penance, and Anointing of the Sick may be administered because they like Viaticum are helpful to ensuring salvation for the dying. All Masses are severely limited, and NO Mass at all appears in the normal liturgy for this day, although Mass can be said on Good Friday and on Holy Saturday for an extremely grave or solemn situation with a dispensation from the Vatican or Local Bishop. Daily Offices are still read and observed by Religious. Liturgically speaking, Holy Saturday ends at 6pm on the eve before Easter. After this time, the Easter Vigil is celebrated, marking the official start of the Easter Season. The service may start with a fire and the lighting of the new Paschal Candle. This is the first Mass since Holy Thursday’s Mass, and during this Mass the Gloria, which is absent during Lent is used. The Altar is properly decorated, and the Statues are unveiled. This is the Mass when all those coming into the Catholic Church are baptized and confirmed. The Easter Vigil lasts about 3 hours, and is one of the most beautiful Masses of the entire Liturgical Season.